This sunny celebration of brilliant summer blossoms will definitely warm anyones heart. A pretty mix of jewel-toned hues and lovely textures make this gift a natural. 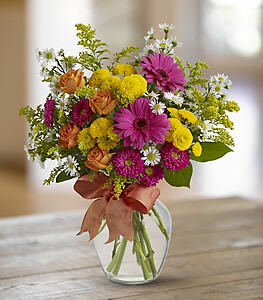 Hot pink gerberas and Matsumoto Asters are arranged with yellow chrysanthemums and spray roses in a pretty vase thats wrapped with orange satin ribbon.